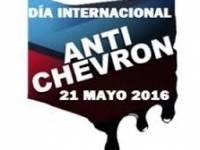 The #AntiChevronDay gains strength worldwide, the global aid is present with actions and support to those people affected by Chevron in Ecuador, to which is added the condemn against the irresponsible behavior of the oil company for its practices violating the environmental and human rights. Various activities will be launched globally for the third consecutive year, prior to the annual meeting of the oil company’s shareholders, which will be held on Wednesday, May the 25th, in San Ramón, California. Quito, May the 20th, 2016.- The #AntiChevronDay became this year in the global fight against the oil corporation, backed by the largest global networks, environmental organizations, outstanding fighters and activists in the field of human and environmental rights, said Donald Moncayo, spokesperson of the UDAPT (Union of People Affected by Texaco). The global launch of Thematic Map  on environmental conflicts caused by the oil company in several countries across five continents is the central event and has allowed to put together the struggles carried on by more than 30 communities that have been affected, their advocates, organizations and activists who support them in their lawsuits against the multinational. The interactive map was developed by ICTA (Universidad Autónoma de Barcelona), A SUD – Ecologia e Cooperazione Onlus, CDCA (Centro di Documentazione sui Conflitti Ambientali), EJATLAS (Environmental Justice Atlas), EJOLT (Environmental Justice Organisations, Liabilites and Trade) and UDAPT (Unión de Afectados por Texaco-Ecuador). It collects proved data on the damages caused by the oil company in its processes implemented for the extraction of crude oil, gas exploitation, fracking interventions, tax evasion, among others, which set a pattern of irresponsible behavior of the corporation and discards the possibility that it is a matter of accidents, as argued by the directors of the company. This confluence leads the affected people and their representatives to sign a statement informing Chevron that from this date they join their struggles to demand compliance with the Ecuadorian judgment in order to repair the Ecuadorian Amazon and to move forward in the processes demanding compliance with its obligations and greater responsibility by the company, to respect human and environmental rights of those territories in which it operates. Nor did the solidarity of personalities of global importance was late to come, activists and organizations acting through global convergences in their struggle to dismantle corporate power and demand supranational regulations to be adopted in order to force multinational companies to respect human rights, which by an open letter report formally their adhesion to the struggle of those affected by the Chevron and especially of the Ecuadorian fighters, which won a judgment considered emblematic and uncovering the structure of global impunity that allows corporations to commit crimes against the people and the environment, especially in underdeveloped countries. In parallel, the voice of the Ecuadorian affected people has been transmitted to pension funds, religious groups, trade unions and universities which have investments in Chevron Corporation, who have been asked to require the managers of the company to provide truthful information about the Ecuadorean case and an action based on the ethics, especially taking into account that not solving the problem (that is the pollution in the Ecuadorian Amazon) generated by the management of the company has challenged its image worldwide, which makes the investments risky. All these documents will be presented to the investors of the multinational in the presentation that Humberto Piaguaje, Coordinator of the UDAPT, will held during the Annual Meeting of Chevron’s Shareholders, which will be held on May the 25th, at the headquarters of the company (San Ramón-United States). A part from these actions, an agenda of events in Ecuador will be developed, which includes an environmental forum, with the participation of more than 30 lawyers who defend those populations affected by environmental conflicts in different parts of the world and who have developed a special agenda that will take place in Quito, as part of the Annual Meeting of Elaw, chapter Ecuador. 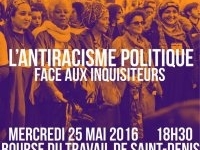 To this, activities planned by various groups in several European countries add up. The #AntiChevronDay is initiative born from the Union of People Affected by Texaco, which develops for the third consecutive year. It aims to draw the attention of the company’s shareholders against the danger to their investments by disregarding the demands of justice of those who are subjected to the irresponsible behavior of those who manage the company. As explained by Humberto Piaguaje, this action is crucial given that those who run the company are lying to the company’s shareholders and by hiding the real situation the corporation experiences by failing to comply with the judgment issued by the Ecuadorian courts, which sentenced the company to pay more than 9,500 million dollars for the remediation of the affected areas in the Ecuadorian Amazon. “Shareholders should be aware that, far from solving the problem, this has become a snowball for the company, facing a struggle that is becoming global”. The pronouncement of the Supreme Court of Canada, which accepted the jurisdiction in order the Ecuadorean plaintiffs to carry on the procedure for approval of the sentence, a process that is underway and whose first hearing will take place in the month of September this year, in Toronto. The affidavits of the former Ecuadorian Judge Alberto Guerra, who accepted to have received payments for his statements against the Ecuadorians affected people, that have been the basis of a fraudulent trial in which the representatives of the Amazonian communities were sentenced as extortionists. Guerra admitted that he received payments and benefits in the US as a witness protected by Chevron, but also that his statements during the trial, known as the RICO Case, were false. The report of a computer expert, who made an investigation of the computer used by the Judge Nicolas Zambrano, who issued the first instance judgment. In his report the expert confirms that the sentence was written entirely on the computer of the Court of Sucumbios, which contradicts the Chevron’s witness’ statements in the RICO trial. Representatives of the UDAPT, argued that now Chevron has the eyes of the world on it and has to answer, while they made a call to the citizens of the world to speak out against the irresponsible conduct of the company and for the justice, actively participating in this AntiChevron Day. As affected people, we fought for 22 years, and we will continue to do so. We never give up until Chevron pay what it owes to the Amazon Rainforest.